Irene Falencki (nee Rytel) age 95, of Lorain, passed away on Wednesday, August 02, 2017 at Mercy New Life Hospice, Lorain, following a lengthy illness. Born on April 22, 1922 in Cleveland, she came to Lorain in 1951. She was a 1940 graduate of East High School, Cleveland. Irene retired from May Co. in Sheffield Center where she worked for 15 years as a sales associate. She was a member of the former St. Stanislaus Catholic Church, and the Altar and Rosary Society of the church. Irene loved spending time with friends and family over a well prepared meal. She especially enjoyed the company of her neighbors while sitting outside catching up on the activities of the neighborhood after a day of gardening or baking delicious goodies. Irene shared that joy for years baking pumpkin rolls with her fellow parishioners at St. Stanislaus Church in Lorain. As a daughter, sister, wife and mother, Irene found her joy and peace in serving, sharing and giving more every day with a beautiful smile. She is survived by her daughters, Annette (Thomas) Bruno; of Lorain and Denise (Robert) Mead of Stow; 3 grandchildren, Thomas (Kristyn) Bruno, Jr, Leslie Mead and Katherine Mead. 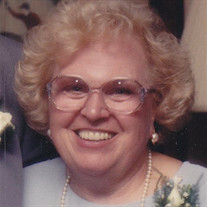 She was preceded in death by her husband of 45 years, Leo L. in 1997; a brother, Ted Rytel; and a sister, Sr. Mary Electa. The family will receive friends on Monday from 9:00 a.m. until the time of Mass at 10:00 a.m. at Nativity BVM Catholic Church, 418 W. 15th Street, Lorain. Rev. Fr. Robert Glepko, pastor will officiate. Burial will follow in Calvary Cemetery. In lieu of flowers, contributions can be made to Mercy New Life Hospice, 3500 Kolbe Road, Lorain, OH 44053 or to the Kidney Foundation, 1370 West 6th Street, Suite 201, Cleveland, OH 44113. The Dovin Funeral and Cremation Specialists, 2701 Elyria Avenue, Lorain will handle the arrangements. To send online condolences, go to www.dovinfcs.com.